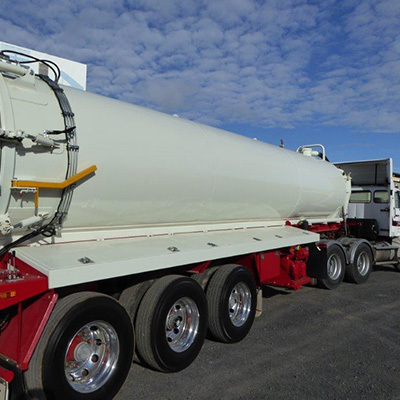 Toowoomba firm Chassis Line has developed a good market for its locally designed tipping vacuum tanker. One of these units was displayed at the Surat Basin Expo in Toowoomba last week, and it helped Chassis Line to promote not only its custom built trailers, but also its repairs and modifications to trailers and trucks, and its waterjet cutting of metals up to 150mm thick. Engineer Gilbert Asanza said Chassis Line had now distributed more than 50 of the vacuum tankers to mining and construction sites such as Chinchilla, Weipa and Roma. They were used principally for waste liquids. But the Toowoomba firm is also a specialist in repairing trailers and truck chassis that are bent or cracked, converting prime movers to body trucks and vice versa, repairing and modifying suspensions, right down to custom built tow bars for caravans. Chassis Line has also developed business for its material processing, cutting, folding, bending and waterjet cutting a range of materials including steel to 150mm thick. Chassis Line engineer Gilbert Asanza with a tipping vacutanker which is used in mining and construction. That really cartpues the spirit of it. Thanks for posting. I was waiting for this sort of matter. Thank you very much for the location.